Dustforce. Age of Wonders. Insurgency. Kholat. Teslagrad. Those are five games present in my growing gaming library that I can’t tell you anything about. I can’t even tell you how I came to own them! But there they are. Part of my collection, buried in the ever-growing backlog. In gaming circles, “backlog” is a term given to the pile of unplayed games anyone possesses. Some people, myself included, even tend to feel a little guilty buying new games when we already own so many unplayed games. But backlog doesn’t necessarily have to be a dirty word. Much like other hobbies, it’s the opportunistic accumulation of goods to be enjoyed at a later date. It’s simply a byproduct of the hobby. To help put all of this in perspective: At the end of 2016, my gaming library contained about 307 different titles. Just for fun I went through and counted every game I had completed on PC since the year 2000. Of those 307 games I’ve completed a total of 70, or about 23% of my library. Going strictly off of basic arithmetic, that means I don’t finish more than 5 games per year. I know my own gaming habits and the time I spend on games, and I should be completing way more than five games per year. What this tells me is that for some reason, I keep going back to the same titles over and over. Again, that’s not necessarily a bad thing. Familiar games can have a huge nostalgia factor and are quite comfortable to play. It’s no different than watching reruns of a favorite sitcom. Why spend my hard earned free time on a new game I may not enjoy when I can maximize enjoyment of my leisure time and stick to something I know is fun? It’s safe and efficient, but there’s also no telling how much I’m missing out on by taking that approach. Playing it safe doesn’t capture what I consider is the essence of gaming; which is to discover new compelling narratives and exciting experiences firsthand. Sticking to what I know certainly is not in the spirit of RavingLuhn, where one of my goals is to, “sift through the games of PC past and present to pull out which ones are worth experiencing today”. I will not purchase any new PC games until July 1st, 2017 or the end of the Steam Summer Sale, whichever comes first. This forces me to focus on what I have. I will play twelve games I’ve never played before; at a rate of at least one per month for the entire year. This, hopefully, will drive the discovery of new, fun experiences. I will write an article about each of these twelve new games as part of RavingLuhn’s content drop in 2017. This allows you, dear reader, to take the journey with me. Focus on what I have. Enjoy it for what it is. Discover some fun stuff in the process. It should be a good year. “Focus on what I have. Enjoy it for what it is.” That could be my 2017 motto. 🙂 I’m planning to simplify and make the most of what I have that I love, and eliminate the fluff. January isn’t a magical do-over month, but refocusing is a good thing at any time! Joseph, looking forward to taking the journey with you! I’m trying to do something similar with my gaming collection. Just curious – how will decide what games from your back-log to play? To be honest with you: I hadn’t thought that far ahead just yet! I’ve got my library entered into a Google Spreadsheet. Each game has the release date listed, as well as a mark for whether or not I’ve completed it. 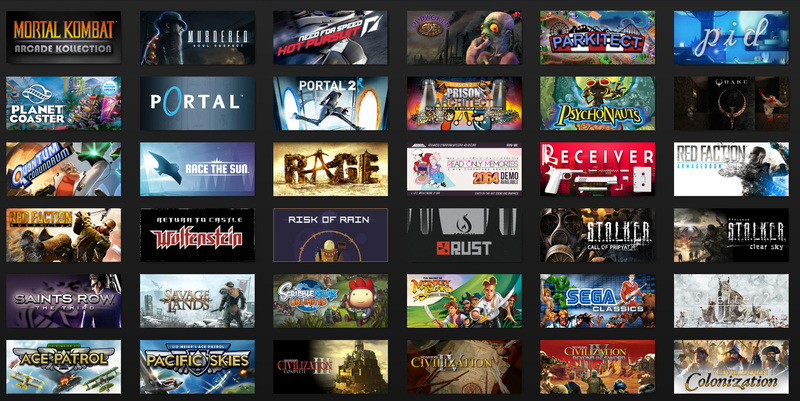 I think I’ll just filter out what I’ve already finished and then try to pick 12 games that are a good representation of gaming years and different genres; focusing on things that are at least 5-7 years old or older.